Manuel's vast historical, architectural and culture knowledge certainly made our tour of the Seville Alcázar Palaces and the Seville Cathedral fulfilling and rewarding. He was able to make these important historical buildings come alive for us. Skillfully navigating the lines with a private guide is certainly the way to go, if you want to make the most of your visit to this amazing city. Manuel is a terrific guide and we highly recommend him. TOUR GUIDE RESPONSE: Dear Claudia and Jim, Thank you very much for your wonderful feedback of our couple of tours in Seville. I wish you all the best. ;) Best regards. Manuel G.
Manuel, a native of Seville, is a good story teller, who made the historical importance of Seville come alive for us, while enjoying the 2 1/2 hour stroll around the old city. He has loads of knowledge about Seville from the early days to the present, but did not overwhelm us with too many names and dates.. Instead we experienced the city through his eyes and got a real sense of how it is to live in Seville today. We also came away with a deep appreciation for Seville's role in the history of the world. TOUR GUIDE RESPONSE: Dear Stephen and Sara, Thank you a lot for the 5 stars! It was a pleasure to lead you in my city. I wish you all the best. Manuel G.
Manuel was outstanding. Very knowledgeable, very charming and spoke very good English. He has a degree in art history, which added an extra layer to our tour. He was also very mindful of his audience, which included children, and accommodated everyone's interests and questions. The alcazar is definitely worth a visit but Manuel included much more and went out of his way to help as well as to give us an appreciation not only of the Palace but also of Seville and Andalucía. TOUR GUIDE RESPONSE: Hola Nicola & family!, Thanks a lot for your lovely words. I wish you a fantastic journey in my land. All the best. Manuel G.
TOUR GUIDE RESPONSE: Dear David, Thanks a lot for your review! ;) All the best. Manuel G.
Manuel is charming, kind and passionate about his city. A true local- generous with recommendations as well. TOUR GUIDE RESPONSE: Hello Lynn, I hope you are fine! Thanks a lot for your wonderful feedback. It was a very interested and funny experience to me sharing my city with you. You have a friend in Seville. All the best. 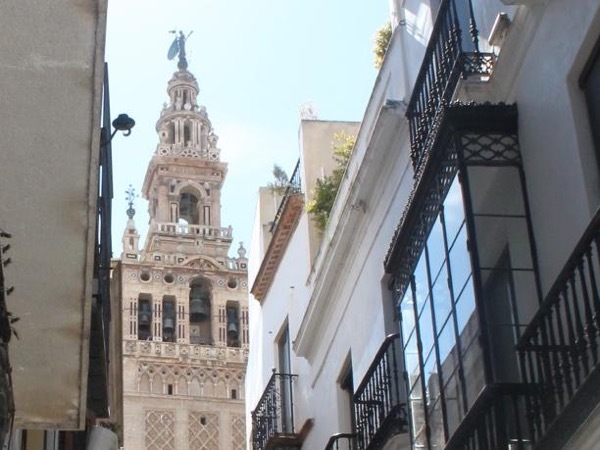 Manuel G.
Manual made us fall in love with Sevilla! He did an outstanding job walking us through his city and highlighing the facilitating history, culture, and architecture that make up the city of Sevilla. We would highly recommend this tour to anyone wanting to get an enriched experience while traveling to this beautiful region of the world. TOUR GUIDE RESPONSE: Hi Jackson, Thank you very much for your wonderful words. All the best. Manuel G.
Touring Seville with Manuel was like walking, talking, and riding with a good friend, a friend that has a wealth of knowledge about his city, and country. Manuel's knowledge of history, art, architecture, and culture was very impressive. We had an amazing day. TOUR GUIDE RESPONSE: Dear James & Vicki, Thank you so much for your wonderful feedback. Actually It was a very special day to me as well. All the best! Saludos desde SEVILLA. Manuel G.
Excellent tour. Manuel is very knowledgeable of Seville- history, art, architecture- threads his stories Together in very interesting way. And he's fun! Thank you Manuel! TOUR GUIDE RESPONSE: Dear Kent, I thank you a lot for your wonderful feedback. We spent a very good time! All the best! Manuel G.
Manuel was a perfect gentleman and a great guide. We had a wonderful day . He was very knowledgeable and very pleasant to spend time with! TOUR GUIDE RESPONSE: Thank you very much for your feedback! I wish you all the best. ;) Manuel G.
TOUR GUIDE RESPONSE: Dear Erwin & Co.: Thank you so much for your feedback and thanks a lot for coming to my city. I wish you all the best. :) Manuel G.
TOUR GUIDE RESPONSE: Dear Richard and Friends: Thanks a lot for your review. It has been a 5* day for us! All the best! Manuel G.
Manuel has a way of getting his clients to love his city as he does. He is genuine and knowledgeable and enthusiastic. There were 4 of us all interested in touring Seville, most especially because it is the sister city of Kansas City, where 2 of us now live. Manuel and his driver did an excellent job of getting us around the city to experience its flavor and warm culture. He enhanced our experience with his vast knowledge of history and art. We had lunch in a local restaurant where we ate Iberian ham for the first time along with good wine and tapas. TOUR GUIDE RESPONSE: Dear Wendy, Thanks a lot for your nice words. I'm so glad for having been part of your travel in my country. All the best. Manuel G.
Seville is Manuel's home and he was justifiably proud of it. He was a fountain of great information, very accommodating and enthusiastic. It was a pleasure having him show us city. TOUR GUIDE RESPONSE: Hello Fred, Thanks a lot for your great feedback. All the best! Manuel G.
TOUR GUIDE RESPONSE: Hello Chad, Thank you a lot for your rating. :) All the best! Manuel G.
Manual was a terrific guide with a wealth of great information about Seville. His passion and knowledge of the city's history and cultural treasures was evident. He made several suggestions beyond the tour that we followed up on and this further enhanced our experience! Thanks for your time and enthusiasm Manual! TOUR GUIDE RESPONSE: Hello Annette, thank you a lot for your rating. It was a very special day for all of us. All the best. Manuel G.
Manuel was extremely knowledgeable about the various buildings and monuments in and around Seville. He had in depth historical perspectives on everything we saw from bullfighting to shipping commerce to architecture history to the Roman occupation and the Spanish Inquisition. We thoroughly enjoyed our 2 1/2 hour tour and also appreciated the tourist tips he gave us. He customized our tour to end at a restaurant where we wanted to go to lunch. We would HIGHLY recommend Manuel as a Seville tour guide. TOUR GUIDE RESPONSE: Dear Pamela and family, Thank you a lot for your amazing review and nice words!. I hope you enjoy very much your journey in my dearest Sevilla-Andalucia. All the best! ;) Manuel G.
Manuel was excellent. He knows Seville well and provided a ton of color around the city. I would highly recommend using him if you are visiting the area. TOUR GUIDE RESPONSE: Hello Joe, Thank you for your nice review! It was great when you told me at the end of the tour: "This kind of tour is what I was looking for.." That is very important for me and for every local guide. All the best. Manuel G.
We had a fabulous tour with Manuel in Seville, he arranged a bespoke tour for us as an introduction to the city Palace, and Cathedral. Communication with Manuel both pre and post booking was excellent. The tour itself was interesting and informative, and Manuel is clearly extremely knowledgeable and passionate about his fantastic city. We would not hesitate to recommend Manuel as a Seville guide to others and would book him again if we return to the city as we hope to soon. TOUR GUIDE RESPONSE: Hello Elisabeth, Thanks a lot for your amazing review! I hope to see you again very soon. All the best for you and your family. Manuel G.
My husband and I really enjoyed our tour with Manuel - the best walking tour we've ever taken. Our guide was Interesting, knowledgeable and polite- the time flew by and the walking was a pleasure! TOUR GUIDE RESPONSE: Hola Cynthia and Phill!, I enjoyed very much as well with you and your husband. I hope you come back soon. :) Thank you for your nice words. All the best. Manuel G.
TOUR GUIDE RESPONSE: Dear Richard, I thank you a lot for your great rate. I wish you all the best. Manuel G.
TOUR GUIDE RESPONSE: Thank you very much for your nice feedback. All the best. Manuel G.
Excellent tour. Manuel was interesting and gave us sufficient information without overloading us with excessive details. He also paced the tour to our requirements. Thoroughly recommended. TOUR GUIDE RESPONSE: Dear Gail and friends, thanks a los for your great comment! It was a real pleasure to lead you in my city. I hope you have enjoyed of your tour in Jerez de la Frontera as well. All the best. Manuel G.
Manuel was very knowledgable and well traveled We enjoyed the tour. TOUR GUIDE RESPONSE: Hello Michaela, Thank you very much for your nice review!!! I hope to see you son! Regards. Manuel G.
TOUR GUIDE RESPONSE: Hi Michaela, Thanks a lot for your rating! I wish you a very happy new year! Best. Manuel G.
Manuel was wonderful!! Very knowledgeable and made the history extremely interesting!! The day was great despite the rain!!!! TOUR GUIDE RESPONSE: Hello Gregory and Eleonor, Thank you very much for your nice words and thank you for your visit to my loved city, dispite the rain... Jeje! Best regards. Manuel G.
TOUR GUIDE RESPONSE: Hi Patrick, Thanks a lot for your rating. Espero que lo paséis muy bien durante este fin de semana. Un abrazo. Best. Manuel G.
EXCELLENT TOUR and very informative. Manuel is the reason the tour was so great: knowledgeable, informative, humorous, helpful, organized, on-time, etc., the list goes on. We opted for a private walking tour on our first full day in Seville. We were 4 adults and we couldn't have been more pleased with the experience. By far, this was one of the highlights of our entire trip to Spain. Thanks Manuel, for a great tour and a wonderful introduction to your beautiful city. TOUR GUIDE RESPONSE: Hi Cindy, Thank you a lot for your amazing feed back. I tried to be part of your travel and as I see I did it!! I'm so glad for this. ;) All the best for all of you. MANUEL G.
Manuel was very knowledgable, interesting, and had great stories for us to inform us during the tour. We enjoyed our time immensely and would recommend his tour to everyone to introduce you to Sevilla and acquaint you with its many highlights! TOUR GUIDE RESPONSE: Dear Anthony, thanks a lot for your fantastic review. All the best for you and your family. Saludos. Manuel G.
We have just finished our tour of the Alcazar and Santa Cruz area of Seville. We were a party of four and the tour was just what we had hope for. Manuel was charming and gave us a wonderful understanding of the history behind the interesting and beautiful places we saw. We'd like to return and do a different tour with him another time. TOUR GUIDE RESPONSE: Hello Carolyn and friends!, Thanks a lot for your nice words. I hope you come back soon to my city. There are so many places to visit! Best. Manuel G.
Manny gave a well organized tour of the city he loves. His enthusiasm and depth of knowledge made this an excellent tour. He and a driver picked us up at our dock in Cadiz and made the four of us much more knowledgeable about Seville and it's history all day. TOUR GUIDE RESPONSE: Dear Janelle!, I'm so happy to hear from you. Thank you very much for your nice words, it was great to share my lovely city with you. All the best! Manuel G.
We recently toured Seville with Manual G. Manual has an incredible depth of knowledge of the history of Seville and of Spain. It seemed that on every street we turned down, Manuel was able to uncover another wonder in Seville to share with us. He gave us a wonderful tour of Seville and helped us discover many of the historic sites in Seville. He also has a terrific sense of humor which we feel is essential to the makeup of a superior guide and made the whole experience wonderful. TOUR GUIDE RESPONSE: Dear Paul, thank you very much for your amazing words. I enjoyed very much sharing my city with you & Co. All the best. Manuel G.
TOUR GUIDE RESPONSE: Dear Robert, Thanks a lot for your rating and nice words. I wait for you next time in Sevilla!. Best! Manual is great - he gave us a real tutorial on Seville and did it at an easy and leisurely pace. His knowledge is first class and welcomed all my silly questions about things we saw. TOUR GUIDE RESPONSE: Dear Chris, There are not silly questions, only bad answers,,, jeje! Thank you very much for your feedback. I hope that your sister enjoys my city during this summer. Regards. Manuel G.
Manuel was a fabulous guide. Not just knowledgable, but excellent at weaving together the historical facts into a great and memorable story. He answered all my many questions with confidence and color to make it a fascinating tour. I wish we had more time with Manuel. TOUR GUIDE RESPONSE: Hello Dana and Friends! Actually we spent a fantastic tour together and it was funny to see you again the following day in "my" fantastic Cathedral. I hope you enjoyed your visit there. Thanks a lot for your nice feedback. Manuel G.
Manuel for was great and very helpful. He was enthusiastic to share knowledge about his city. We had a lovely time. TOUR GUIDE RESPONSE: Vishal, thank you very much for your nice feedback. It was a pleasure to work with you. TOUR GUIDE RESPONSE: Dear Nancy, Thank you very much for your nice comment!!! All the best. Manuel G.
Manuel went above and beyond, giving us an amazing tour of this city we grew to adore in he rest of our stay. His tour was a perfect introduction of all the highlights of Seville and his knowledge of the city in which he grew up was abundantly evident. Out lunch together following the tour was so enjoyable because of his superb selection of the place and such enjoyable company. TOUR GUIDE RESPONSE: Hello Susan and Jeff, Thank you very much for your beautiful review! Actually, we spend a fantastic day together. You have a friend in Sevilla. Muchas gracias! Manuel G.
This was a favorite tour of our group of 6. Manuel was an expert in his town of Sevilla. He showed us the most important sites and included a few surprises. A most informative guide. We will recommend him to anyone we know traveling to his part of Spain. A truly delightful day!!! TOUR GUIDE RESPONSE: Hi Jill, Thank you very much for your review. I hope that have enjoyed your cruise and I hope to see you again in Sevilla, my loved city! ;) All the best for you and your lovely group of travelers. Manuel G.
Please give Manuel Gonzalez L. the highest rating possible . Five star plus. He and Luis were terrific !!!!!!!! TOUR GUIDE RESPONSE: Hi Joan, Thanks a lot for your review. Actually I enjoyed a lot with Timothy and friends. They are very learned and friendly clients. All the best! Please give Manuel Gonzalez L. the highest rating possible. Five star plus. He and Luis were terrific!!!!!!!! This is the perfect tour for small groups looking for a way to see Sevilla accompanied by a guide. Our group of 9 was picked up at the port driven to Sevilla to start a walking tour of the city center, the Real Alcazar, and the Seville Cathedral where the remains of Columbus are on display along with the rich history of Spain. Wonderful way to see the city from ground level. TOUR GUIDE RESPONSE: Dear Andy and friends, Thank you very much for your nice words. It was a pleasure to enjoy this tour with you. All the best. Manuel G.
Manuel presented an excellent walking tour of the city and it's sights during a driving rain storm. His attention to our comfort as well as our desire to see the sights resulted in a tour that exceeded our expectations. He provided a keen insight into the city's history and development including the identification and history of numerous buildings from the city's international exhibitions. TOUR GUIDE RESPONSE: Dear Shirley, Thank you very much for your beautiful public comment. All the best. Manuel G.
This was possibly the best tour we've ever had. From the moment I contacted Manuel to the moment we said goodbye, he was the ultimate professional. We were a party of 4 travelling to various parts of Spain including Seville. We asked Manuel for a private, custom designed tour of the city, a cooking class and on day 2, a trip to Jerez de la Fontera to tour a sherry producer and a visit to Gibraltar. Manuel arranged all of the details perfectly. We highly recommend Manuel and hope to see him again soon. TOUR GUIDE RESPONSE: Dear Doug, Ron, Allyson and Scott, Your tour have been really special for me. Thank you very much for your kind message. Here in Sevilla you have a friend. All the best. Manuel G.
Absolutely outstanding. An excellent guide and a pleasure to be with. Recommend him highly to anyone coming to Seville. Very accommodating. I started the tour with 3 cameras. I gave him a Point-n-Shoot and he took pictures for the entire tour. Am sure he got some good ones of me with monuments in Seville. TOUR GUIDE RESPONSE: Hello Chuck!, Thanks a lot for your nice words. Actually I spent a fantastic day with you, giving you explanations and showing hidden places of Sevilla where you could take the best pictures of my city. I hope you enjoy your travel in Tanger! All the best. Manuel G.
TOUR GUIDE RESPONSE: Hi Stacy, Thanks a lot for your great message. All the best from Sevilla. ;) Manuel G.
Manuel us an absolutely fantastic guide. He was extremely knowledgeable, very friendly, and went far beyond what was necessary. Highly, highly recommend Manuel. TOUR GUIDE RESPONSE: Dear Patrick, I was very proud to guide you in my city and showing you the FERIA DE ABRIL. It was something very special to me!. Thanks a lot for your kindly feedback. All the best. Manuel G.
Hola, Manuel! What a wonderful time we had with you! Your love and passion for your city and its culture was obvious and infectious! We also very much appreciated your deep understanding and knowledge of history, religion and art (and Game of Thrones)! You made our visit to Seville one that we will remember fondly, and with beautiful memories. GRACIAS, Manuel! TOUR GUIDE RESPONSE: Hola Sona, Thank you so much for your wonderful words. Your personal assessment is true, since basically I LOVE my city and I try to share it with my clients-friends. All the best for you and for your lovely family. Manuel G.
Really enjoyed Manuel's perspective and knowledge of his city. The polyglot architecture of old Sevilla is fascinating if you know what you are looking at, and Manuel makes sure you do! TOUR GUIDE RESPONSE: Dear Mark & Co., Thank you very much for your review. I wish you a very happy new year, full of travels and amazing experiences. All the best! Manuel G.
Manuel is an excellent guide. He is very knowledgeable and speaks excellent English. We had a great time with him and appreciated his insights into the city of Sevilla and its people. Take a tour with him and you won't be disappointed. TOUR GUIDE RESPONSE: Dear Linda, Thank you very much for your review! It was great to enjoy my city with you. Here you have a friend. ;) All the best. Manuel G.
We had a wonderful day in Seville with Manuel. We saw so many fabulous places around the city and learned so much about Seville. It was a beautiful day and we so enjoyed Manuel's view of his hometown. TOUR GUIDE RESPONSE: Dear Vicki, Thank you very much for your nice comments about my work. It was a pleasure and I look forward to meeting you in the future! ;) All the best. Manuel G.
TOUR GUIDE RESPONSE: Dear Gordon, Yesterday we enjoyed a fantastic tour. Thank you for your love for the History and your interest in my city. I wish all the best for both of you. Manuel G.
Manuel was so wonderful that he made the tour extra special. He is knowledgeable, friendly professional, and fun to be with. I cannot say enough about how we enjoyed the tour and spending the day with him and his driver Pepe. His knowledge of his towntown and English are excellent. I will never forget he tour!! TOUR GUIDE RESPONSE: Dear Patricia and Friends, Thank you for letting me spend a day in your holidays. I´m sure that you will never forget the tour, and please, never forget my city! ;) All the best. Manuel G.
Guide was very prompt, personable, knowledgable and flexible. Very nice experience , would recommend . TOUR GUIDE RESPONSE: Dear David and Sue. I really enjoyed meeting you and had a great time showing you my city. Thank you for letting me spend a few hours in your wonderful company and of course, thank you very much for your gift. Sue, I will read your book, I feel that it will be very special for me. All the best. Manuel G.
Seville is so lovely it practically guides itself but our time with Manuel added immeasurably to our knowledge and enjoyment (to say nothing of bypassing the lines!) of the Alcazar and Cathedral. He is articulate, organized, well informed and very pleasant. He also gave us a number of helpful tips about tapas bars and restaurants, and visiting the tile workshops in which I'm interested. We highly recommend him. Thank you, Manuel! TOUR GUIDE RESPONSE: Dear Catherine, thank you a lot for your comments. It was a pleasure to provide the tour for you. I hope you have found nice pieces of ceramic from Triana. ;) All the best. Manuel G.
TOUR GUIDE RESPONSE: Fantastic and sunny day and of course fantastic and nice clients yesterday! Dear Natalie and Jerry, it was a pleasure to meet you. All the best! Manuel G.
TOUR GUIDE RESPONSE: Dear Elisabeth, thank you a lot for your review. It is very easy to work with clients like you. All the best! Manuel G.
Manuel provided us with an excellent tour & the flexibility we needed. He is very knowledgeable & provided exceptional background & historical perspective. We highly recommend him & will retain him again next time we're in Seville! Many thanks Manuel for a great day! This was a fantastic tour in large part due to our extraordinary guide Manuel and our driver Carlos. Manuel's knowledge of the area and it's history far exceeded our expectations. He was professional, courteous, very personable and flexible. I wholeheartedly recommend him! It was a pleasure spending the day with him! TOUR GUIDE RESPONSE: Dear Leonard, Thanks a lot!, it was a pleasure to spend the time with you. Hope the rest of the holiday with your wife goes well. Best regards. Manuel G.
Manuel is a great tour guide, he knows much about the city of Seville, the culture and monuments. We enjoyed listened to his narratives and seeing several Sevillle sights with him. He also gave us some great restaurant recommendations. TOUR GUIDE RESPONSE: Thanks a lot!! Best regards. Manuel G.
TOUR GUIDE RESPONSE: Dear family, thank you very much. It was very funny to work during your tour. Sorry for the high temperature, but it is part of our culture!!! Regards! Manuel G.
Manuel was great! His knowledge of the Cathedral and the Real Alcazar was extensive and thorough. Manuel gave great information without going overboard and boring the group of teenagers that we had. He adjusted his tour to match our group and was very willing to do whatever we wanted. I will definitely use him again when we return to Sevilla with another group. TOUR GUIDE RESPONSE: Muchas gracias Todd! Fue un placer atender a tus chicos. Sólo espero que algún dia podamos ir juntos a la "cueva de la Pileta"... ;) Thank you a lot. Here you have a friend! We have had two tours with Manuel, both days were fabulous, really, really good. He was so informative, really interesting, and explained in a clear and concise manner. If we came agin to Seville we would book again with Manuel. We have been very satisfied with the tours. TOUR GUIDE RESPONSE: Dear Nancy, thank you very much for your rating on the tour! I am glad you enjoyed your couple of days with me in my city. It was a pleasure to be your local guide in Sevilla. Saludos, Gracias! We had a great time, and based upon the limited amount of time Manuel had he did an amazing job showing us around. We would highly recommend his services. Reasonable tour, but no real "hidden gems" as the Tours by LOCALS would suggest. Value proposition weak in cost v price. Very kind guide, but we missed a bit more in-depth explanation. TOURSBYLOCALS RESPONSE: The other reviews of Manuel's tours have been excellent, but we have discussed with him ways to add more value to this tour. A partial refund was provided. Manuel is very knowledgeable and managed to answer our extensive questions in all our areas of interest. We had a great time with him. TOUR GUIDE RESPONSE: Thank you very much again. It was a pleasure for me. Best regards! can't say enough about Francesco and Manuel, they were the absolute perfect tour guides and they gave my large group of US travelers a wonderful series of impeccable tours in and around Seville. I especially appreciate that these two professionals were highly pro-active in making sure all details were in readiness for the next-day programs. Doug Schroeder, travel agent. TOUR GUIDE RESPONSE: Dear friends, It has been a pleasure and great delight working with you. Thank you very much!. I can't say enough about Francesco and Manuel, they were the absolute perfect tour guides and they gave my large group of US travelers a wonderful series of impeccable tours in and around Seville. I especially appreciate that these two professionals were highly pro-active in making sure all details were in readiness for the next-day programs. Doug Schroeder, travel agent.